It's a long-standing truth in the music business that most artists make most of their money playing live. Performing in clubs and small venues, however, is challenging, very competitive, and wrought with issues that keep many acts from ever getting anywhere. Booking agents can help you get bigger gigs, but they usually won't work with you until you've already booked a bunch of gigs on your own. After all, they work on a percentage basis, and until you can show them that they can earn a meaningful commission by expanding on your efforts, they'll book other bands. Promoters and club owners will generally only book bands who've proven they can draw a crowd. So how do you draw a crowd when you can't really get help from agents and promoters early in your career? This is a conundrum that has stopped many bands right in their tracks. Luckily, the internet has opened up a lot of new doors for indie musicians, especially in the realm of direct-to-fan. Today, some musicians, like Shannon Curtis, are skipping the clubs and venues altogether and embarking on entirely fan-hosted house concert tours. The very term "house concert" may bring to mind images of out-of-control college parties or wedding receptions where the music is just background noise. But Shannon Curtis has made it work – and by "work," I mean it's more profitable than any club tour. Shannon will be sharing her experiences and tips in this free webinar that I'm hosting on December 3rd at 1 p.m. EST. Here are three quick tips for a successful house concert tour that we will explore in detail during the webinar. The number one mistake musicians make when dabbling in the world of house concerts is viewing it as a house party. With this approach, you’ll undoubtedly end up playing for people chatting and nibbling at appetizers. If you don't make it a show, you and your music won't get much attention, you won’t get many donations, and you probably won't make many merch sales. People get distracted easily, especially when surrounded by friends and food, so you need to make it an event. To get people’s attention, set the event up like a concert – where you're the main focus. This means you need to set the space up like a venue, with you in front and seating for everyone. Have a defined start time and stop time for your set, and make sure everyone is aware of it. There will be plenty of time to socialize before and after. These crucial steps will ensure you get everyone's undivided attention. Most people have never hosted a house concert before and may not even know where to start, so it's your job to help them put on a great event. A confident and comfortable host will make for more engaged guests, and that can translate to more donations and merch sales for you. Be in direct communication with your host well before the show date. Tell them exactly how many guests you need to attend to make the trip worth your while, how the timing of the event will be organized, and how you'll set up the space. (We'll discuss these specific details in the webinar, so be sure to join!) Of course, you don't want to be a control freak. Giving your hosts the freedom to plan their event will make them enthusiastic, but a little guidance will ensure that you get what you need out of the event. 3. Don’t be afraid of the "ask"
This is the single most important point of a successful house concert, beyond playing a great show. In Shannon Curtis's model, donations are how you'll make money – and if you don't ask, no one will give. Asking for money is something all musicians feel uncomfortable with – it’s downright awkward blowing your own horn – but a properly executed "ask" by your host can be the difference between a gig that’s a flop and a financially successful night. In Shannon's model, the host asks for donations for you. There are a few reasons behind this, the main one being that the host is a trusted source for the guests. The "ask" will make more of an impact coming from the host – a friend or family member to the guests – than it would coming from you, a complete stranger. You as the artist really need to take the time to prepare the host for this donation request. In our webinar, Shannon will be telling you exactly how to do that, so be sure to join to get this extremely important information that could make or break your house concert. Properly coordinated, the host will ask for donations right after you've wowed them with your killer performance. Afterwards, you can direct people's attention to your merch table where you can sign stuff and give the audience some personal attention. This gives you two different income streams from one house concert. As you can see, there's more to planning a truly successful house concert than you may think. House concerts can be extremely lucrative if you have the right strategy. We will lay all of this out and more in a FREE webinar with Shannon Curtis. She'll be sharing some of the best tips she's learned by doing hundreds of house concerts. 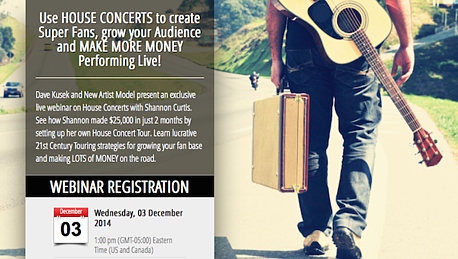 I hope you'll join us and get the specific strategies you need to start making serious money from gigging. If you're interested in learning more about how you can create a plan for success for your band or career, check out the New Artist Model, the alternative online business school for independent musicians, songwriters, producers, managers, and new businesses. You can see a free video mini-series here on musician strategies, team building, booking gigs, copyrights, and setting up multiple revenue streams.